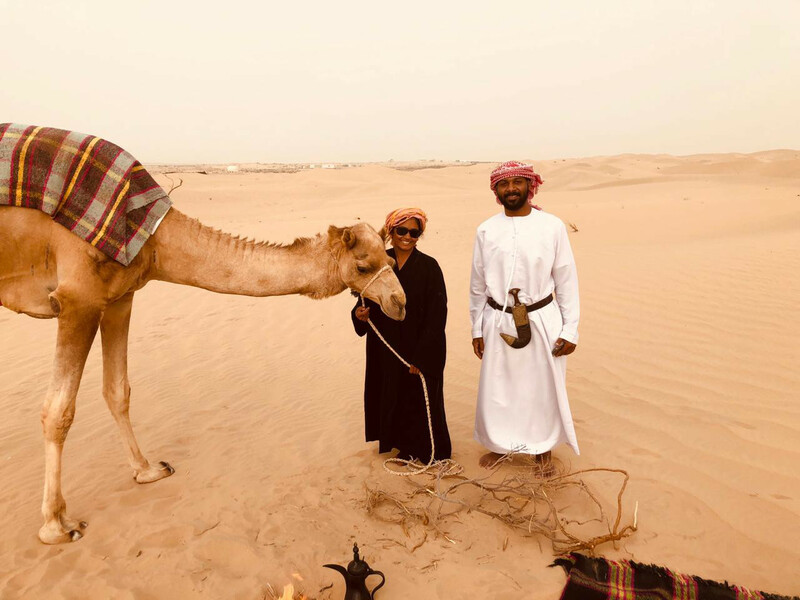 Abu Dhabi: Looking to recreate the origins of a historical Bedouin poetry form known as Al Taghrooda — two residents have embarked on an 11-day journey by camels from Abu Dhabi to Sharjah. 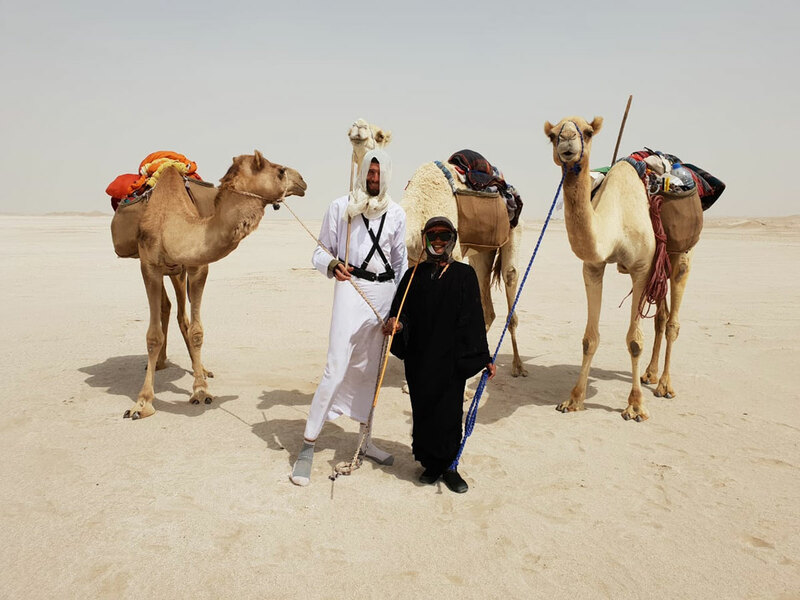 Setting off on March 22, the team of two — Michael Meztger from the US and Shirley Wilkinson, a British-Indian resident — aim to reach Al Madam in Sharjah by April 1, with their entire journey seeing them going through the desert unassisted. Al Taghrooda is a tradition that started among Bedouin camel riders to pass the time during their long and arduous journeys through the desert. Coming in the form of chants and singing, Al Taghrooda utilises short poems with short verses that are repeated by the group. The topics contained within Al Taghrooda range from social issues, historical events, and showing love for one’s family and tribe. “Our objective is to have people understand the meaning and value of this ancient poetry form, and how we as expatriates living in the UAE can learn from this ancient tradition that has remained even with the age of modernisation and industrialisation,” he added. Our objective is to have people understand the meaning and value of this ancient poetry form, and how we as expatriates living in the UAE can learn from this ancient tradition that has remained even with the age of modernisation and industrialisation. 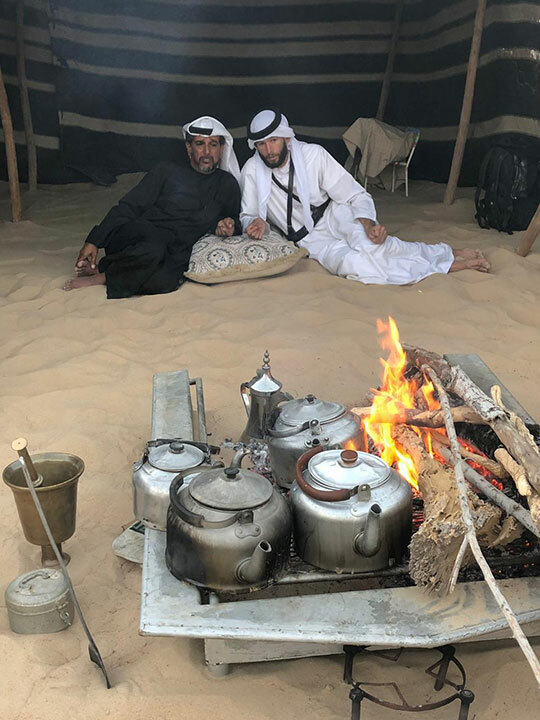 Metzger said they have met Emirati poets well versed in Al Taghrooda tradition along the way, sharing their poetry in the heart of the desert in true Bedouin fashion. “We have had a couple of ceremonies so far, where we have had these Emirati poets meeting with us and sharing their beautiful poetry. As soon as they arrive they set up their area, they give us an introduction and then they start reciting, singing and chanting their poetry. “It’s really remarkable to be able to witness because you’re getting the chance to see a tradition that has been passed down through generations. These poems have so much wisdom and teachings in them covering topics that are very important to the Bedouins,” he added. “After the Emirati poets are finished, I like to exchange in what I call a cross-cultural dialogue where I ask them about how Emiratis have managed to continue this tradition, what the poems mean to them, and how they intend to keep this art form alive for the coming generations,” Meztger said. And just like the Bedouins of the past, journeying across the desert and its harsh environment has made the experience much more satisfying, according to Metzger. “We are retracing their footsteps and matching the same experience they had to go through in the past — out of which Al Taghrooda formed. “The first five days of our journey saw us battered by sandstorms which made it a huge challenge for us, we could barely see anything, our eyes and dress all covered in sand which also slowed us down. But that’s the gritty nature of crossing the desert, making this whole adventure all the more real,” he added. The way the poems are structured I find to be really interesting as well, they’re not like your usual English or even most Arabic style of poems, they are very short with only a few words and very easy to remember. Wilkinson, a long time resident, living in the UAE since 1976, said it was her first time to take part in such an experience, speaking glowingly about what she had learnt on the journey so far. “I’ve never been exposed to such poetry before and so it’s been really interesting to be able to learn and watch Emirati poets performing this ancient tradition for us. “The way the poems are structured I find to be really interesting as well, they’re not like your usual English or even most Arabic style of poems, they are very short with only a few words and very easy to remember. You can find yourself going along with the chants and the rhythm because it’s very melodic due to the way it is structured,” she added, highlighting how she found herself immersed within the poems. “Each Emirati poet gave us a different experience and insight, so we’ve been learning new things with each visit along with having fun singing and chanting together,” she said. Wilkinson also spoke positively on the support they’ve received during their journey, with several people offering them food, water and other items to ensure their journey’s success. “We have been shown a lot of kindness on the way from people who’ve stopped to ask what we’re doing. We had Emiratis giving us water, food, and the traditional Arabic Gahwa. “That’s the authentic Bedouin hospitality, and it was great to see because this journey has been all about exploring and understanding Bedouin traditions. It’s been a truly magical journey for me so far,” she added.